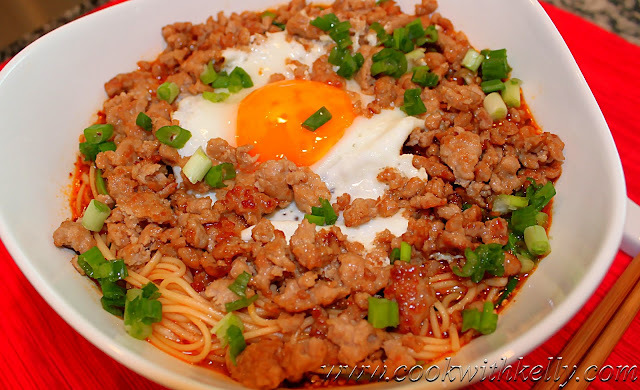 I have been cooking Sichuan food a lot lately and this Sichuan Dan Dan Noodles is a classic Chinese Sichuan dish. I have posted another similar dish - Dried Tofu Dan Dan Noodles where I used my leftover Sautéed Chives with Dried Tofu as the sauce base and then used a small amount of Dan Dan noodle ingredients. This recipe, however, is a more authentic Sichuan Dan Dan Noodles which I learned from my mom when I was a teenager in China. In Sichuan, there are lots of restaurants and food stands serving this dish. Because it's a simple dish to make, a lot of people make it at home as well. My brother and I used to cook this for breakfast but now I prefer it for lunch or dinner. Marinate the pork. Prepare your sauce base before cooking the noodles. Make sure it’s evenly mixed. Bring half pot of water to boil. When the water is boiled add noodles. In about 4 minutes the noodles are ready. Blanche the pea sprouts in boiling water and then transfer everything to the bowl. Add a half-cup of water from the pot (or homemade soup if available). Mix everything evenly with the sauce. While the noodles are cooking, take a medium non-stick pan and heat up 1 tbsp olive oil in medium-high heat. Add the marinated pork to cook. Stir and make sure the pork is not in one chunk. After about 4 minutes the pork is ready. Add the egg in the center of the pan and turn off the heat. The egg will cook sunny side up by itself. Add the cooked pork and egg on top of the noodles and garnish with chopped green onion. Now you are done!! These delicious Dan Dan Noodles can be made in only 20 minutes! Enjoy! This is yummy! Thank you for sharing. If I can't find sesame paste and maybe the pickle too is there any replacement for it? I think some people use peanut butter instead of sesame paste.